Read all about the app in this interview with Dr. Jeffrey Fudin by Practical Pain Management! Dr. Fudin and colleagues are happy to announce that a new UDT smart phone app (URINTEL) is released for the iPhone, Android and PC/MAC (web). This product is user friendly and shall empower clinicians to properly evaluate immunoassay UDT results and guide them in the appropriate direction and actions to take when faced with an unexpected result that yields illicit substances, true and false positives or negatives, and when to quantify results confirmed by definitive gas or liquid chromatography mass spectrometry (GC-MS or LC-MS). Definitive testing is often recommended and implications for missing synthetic cathinones and/or synthetic cannabinoids will be noted as part of the printable (and downloadable) recommendations. AN EQUAL PLAYING FIELD: A standard practice to interpret these urine screens by immunoassay has been lacking for years, and as such patients and providers have suffered innumerably. The time has come for individualized patient care, guidance for clinicians (and support for their clinical decisions), and a double check for patients! 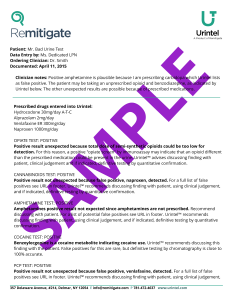 This robust tool allows the user to better understand appropriate decision parameters and whether or not the assessment of lab results considers false negatives or positives and drug interactions when evaluating their urine screen results, the purpose of which is to improve communications and encourage patient safety and positive outcomes. It will help clinicians decipher all the potential permutations and more uniformly arrive at a therapeutic decision. It will help managed care third party payers to uniformly assess logical reasoning for approval and payment for immunoassay and definitive testing by chromatography. This application considers all of these parameters and continued development will incorporate even more individualized patient uniqueness. Check out our easy 3 step tour to see what Urintel is all about! What an innovative and unique service this will be to patients, providers, medicolegal entities, and regulators. We all benefit when we know the facts. I believe that there is a definite need for tools that help the healthcare provider manage the risk/benefit profile when opioid analgesics are an appropriate component of chronic pain therapy. I particularly often receive questions about the interpretation of Urine Drug Testing results, and best steps to take regarding patient safety. I also fully endorse anything that can assist the patient-healthcare provider dialogue and shared decision-making. A tool like Urintel is long overdue as a technological complement to managing opioid analgesic therapy. Jeff, I have ran a few patients through the Urintel. I like it! I find it easy to use & fairly self explanatory. I also like the ease with which the medications that produce a false positive or negative can be accessed. I’ll use it some more in the coming days and provide you with more feedback. Urintel combines expert clinical advice in an innovative and easy to use format. The answers to the most common clinical questions are at your fingertips. This customizable tool allows dose-appropriate interpretation and could become a daily part of your clinical practice. Urine drug testing can be a valuable tool when caring for patients with chronic pain, substance use disorder or who are at risk for substance use disorder. Like any test urine drug testing needs to be coupled with a careful history and physical exam. It also needs to be coupled with knowledge and information about the proper interpretation of the results. This APP is extremely helpful to enable the user to incorporate urine drug testing into their practice in a meaningful productive way. It is meant to be used within the context of an office visit in which a clinician needs fairly rapid but reliable information prior to discussing results with patients. I highly recommend this APP to all clinicians doing urine drug testing in their practice. This is a tremendous tool for facilitating fast and effective risk mitigation! Great job, Jeff!!!! An innovative tool like this will help healthcare professionals interpret urine drug screen results more efficiently, especially in patients with more complex regimens or aberrant behaviors. It is extremely helpful that the app includes links to common medications that may cause false positives, as this information can take time to look-up in clinic. I will definitely be telling the providers I work with about this app! The presence of other medications and corresponding influence has been a significant issue inhibiting accurate interpretation of urine screen findings. Urintel now provides clarity around the extent to which other drugs have on urine screen to allow for a greater level of confidence and accuracy with result interpretation. Urintel provides a confirmative validation of urine screen results and mitigates concerns relative to the complex polypharmacy of a given patient’s regimen. In fact, I tested the open beta using the following highly complex patient treated by a Physical Medicine doc for Reflex Sympathetic Dystrophy (RSD). The Urine test results was negative for opiates on the following regimen. Fentanyl 200 mcg q72h; Dilaudid 8 mg q4h PRN; Phenergan 25 mg po q6h prn; Flexeril 5-10mg TID PRN; Gabapentin 1200mg po TID; Valium 20mg TID PRN; Zofran PRN; Trazodone 50 mg qHS; Dexilant 60 mg po daily; Amitriptyline 50mg daily; Celexa 20 mg daily. 2. Pesce A, West C, Egan City K, Strickland J. Interpretation of urine drug testing in pain patients. Pain Med. 2012 Jul;13(7):868-85. Atkinson TJ, Fudin J. Interactions Between Pain Medications And Illicit Street Drugs. Practical Pain Management. 2014 August; 14(2): 50-61. Hammett-Stabler CA, Webster LR. A Clinical Guide to Urine Drug Testing. An educational activity designed for primary care physicians, family physicians, and pain physicians. Leavitt SB, Reisfield GM. Introducing “Understanding UDT in Pain Care”. Blog post on Paintopics.org. August 27, 2012. Gourlay DL, Heit HA, Caplan YH. Urine Drug Testing in Clinical Practice. The Art and Science of Patient Care. Ed6. Presented by the Center for Independent Healthcare Education. August 2015.